When it comes to high-yielding soya production, the Netherlands probably isn’t the first country that springs to mind. But a group of innovative Dutch growers are proving that farmers in north-western Europe have the soils, climate and skills to produce soya crops to rival even those grown in South America. 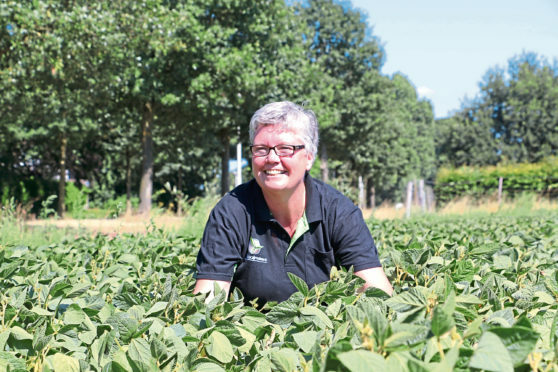 Jolande Raaijmakers and her husband Ad are members of a 90-strong co-operative of farmers across the Netherlands, who between them planted 475ha of soya beans this year. Having traditionally focused on growing lilies, wheat, barley, maize and alfafa on their 100ha in Best, Southern Netherlands, the Raaijmakers first decided to experiment with soya in 2017. “We’ve always been interested in soil fertility and the health of our land, so we’ve focused on crop rotation and ways to improve organic matter in our soils,” says Jolanda. This year the couple planted 10ha of the crop – 3.5ha of which are organic – choosing varieties from the five selected by their grower cooperative, Royal Agrifirm, which can cope with the Netherlands’ moderate climate. As well as being ecologically helpful, thanks to its nitrogen-fixing abilities, the crop is lucrative for Dutch growers. A contract between Royal Agrifirm and Danone-owned soy drink manufacturer Alpro, which takes 80% of production, has seen growers net an average of e685/t. Learning to grow soya in an unconventional climate hasn’t come without its teething problems, however. Beans grow low to the ground, making them difficult to harvest if seedbeds aren’t level, or if larger combines are used. “Last year we had 3.5t/ha in the field in our organic crop but only harvested 1t/ha,” Jolande says. “We’ve learnt this year that we need to make the soil very flat before we sow it, and use a small combine. As many of the members of the co-operative grow soya as part of a rotation with potatoes, there have also been issues with sclerotina. This year’s drought also created issues, as the seeds struggled to break through the dry soil and those that did often looked limp. “We had a field that failed to germinate as we had 65mm of rain in 30 minutes, but in the summer, we had problems, too,” she adds. Despite the challenges, Jolande and Ad are prepared to be patient with the crop, while Henk Vermeer, Royal Agrifirm’s soya been project manager, is confident that the co-operative’s yields will be good this year. “Our yields are now better than Brazil because we have the right skills and the right soils,” he says. What’s more, he says the crop’s performance, costs of production and price mean that soya is a viable and profitable alternative protein crop in the Netherlands. “The cost of production is e750/ha, including all herbicides, but a lot of our growers say soya is very strong and they do as little as they can to it,” he says. “If they are in an area with lots of potatoes, they need protection from sclerotina, and weed protection is also important. Having initially introduced the crop to produce feed, the switch to food production, thanks to the contract with Alpro, has further added to soya’s value. “Everyone gets e500/t, but there are bonuses for the amount of protein delivered,” he says. Protein is important as average levels of the Dutch crop are 41%, so Alpro mixes local supplies with Canadian soy to get the protein level to the 42-44% it requires. With average net profits reaching e685/t last year, soya was ahead of spring wheat (e517/ha) but below winter wheat (e702/ha), Mr Vermeer adds. However, the top 25% of growers made more than winter or spring wheat. “We think it offers a good option for growers, particularly if they have cattle to feed as they can use the crop for their own animals,” he adds. “We’re already seeing acreage grow, and we think it could reach 3,000-4,000ha in the coming years. “Farmers are very curious about the crop and are interested to learn about it.